Primary mandibular molars have been usually described as having two grooved and divergent roots that flare to accommodate the developing permanent premolars. 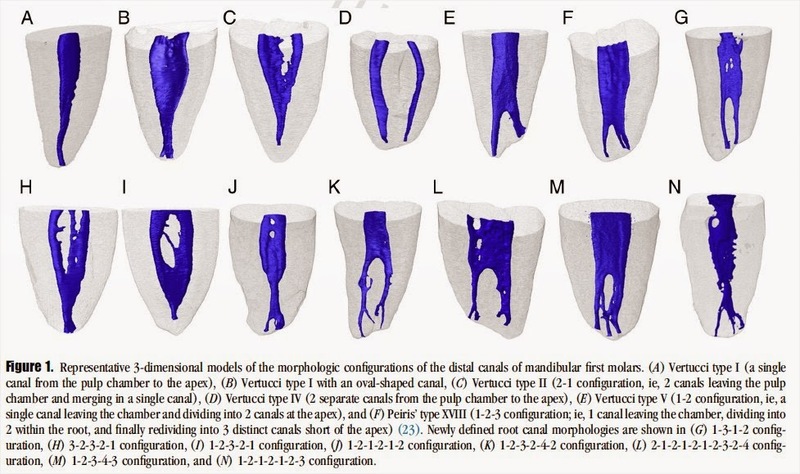 In the literature, a considerable variation in number and shape of canal systems has been described in this group of teeth. 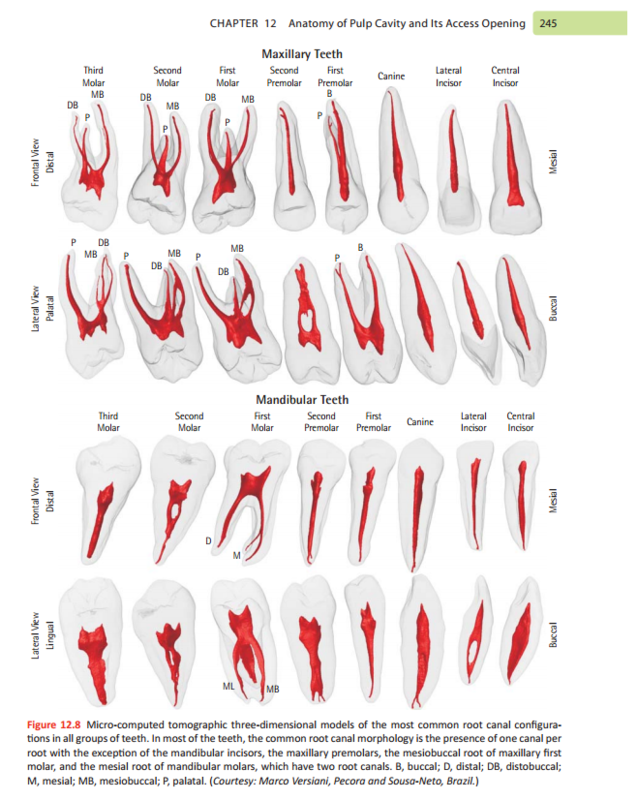 Overall, it may be inferred that the external and internal anatomy of the primary mandibular first molar closely resembles the primary mandibular second molar. Most studies have found either one or two canals in each of the mesial and distal roots. 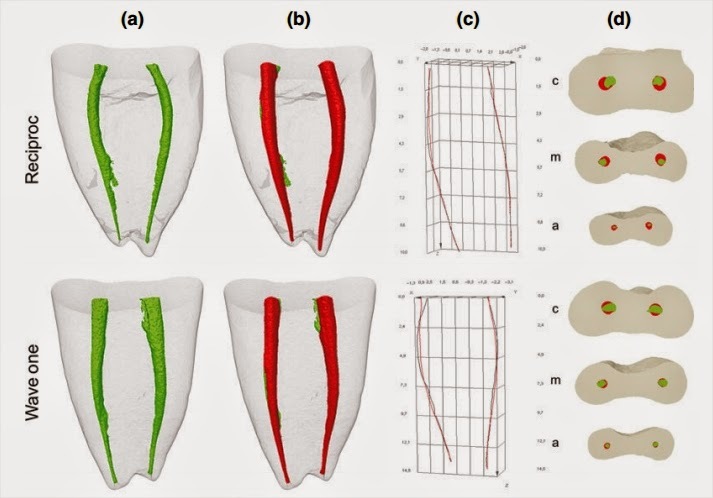 The aim of this study was to introduce a methodology to map irrigant spreadability within the root canal space using micro-computed tomography (micro-CT). 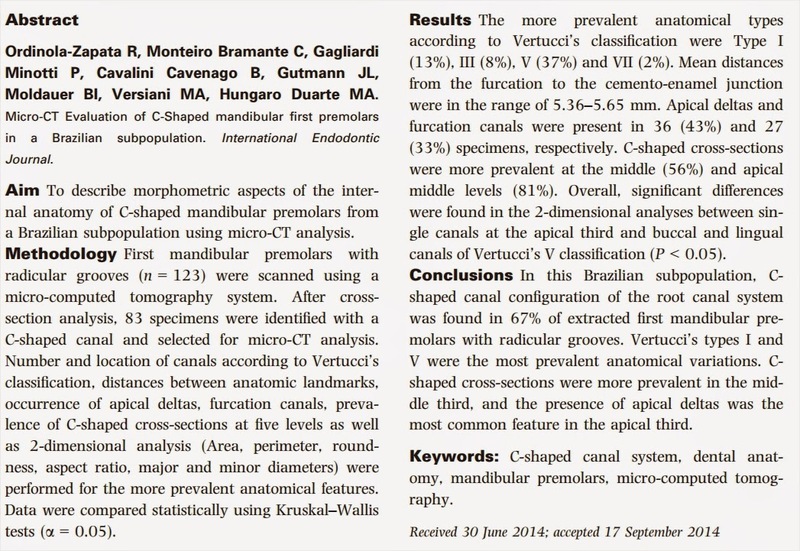 Mandibular molars presenting Vertucci’s types I and II canal configurations were selected, and four scans using isotropic resolution of 19.5 μm were accomplished per tooth: prior to treatment (S1), after glide path (S2) and after root canal preparation (S3 and S4). A contrast solution (CS) was used to irrigate the canals at stages S2 and S4. The touched and untouched surface areas of the canals, the volume of irrigant-free areas and the percentage volume occupied by the CS were calculated. Density, surface tension and the spread pattern of the CS and 2.5 % NaOCl were also evaluated. 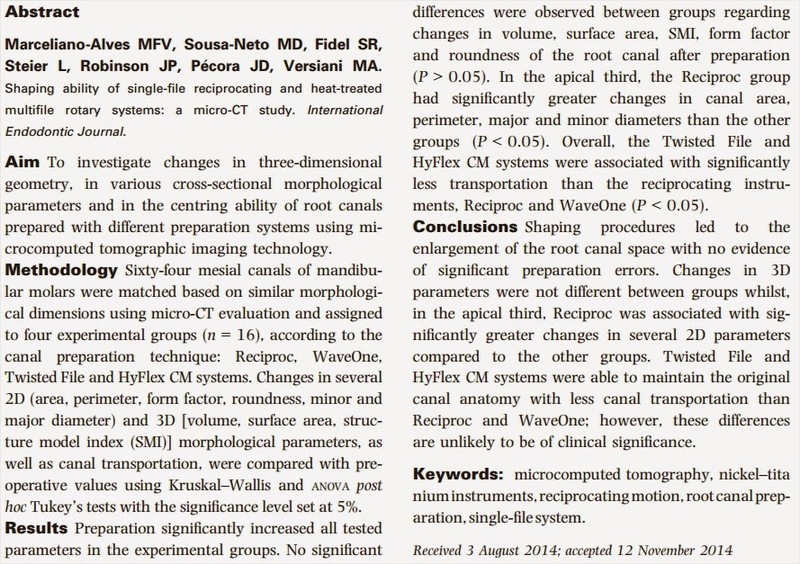 In the type I mesial root, there was an increase in the percentage volume of free-irrigated areas from S2 to S4 preparation steps, whilst in the distal roots and type II mesial root, a decrease of irrigant-free areas was observed. 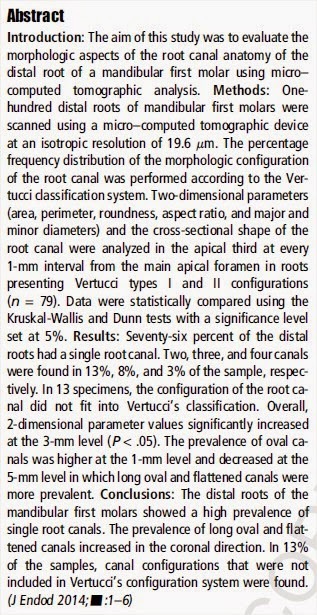 The use of CS allowed the quantification of the touched surface area and the volume of the root canal occupied by the irrigating solution. Density (g/mL) and surface tension (mN/m) of the CS and 2.5 % NaOCl were 1.39 and 47.5, and 1.03 and 56.2, respectively. Besides, a similar spread pattern of the CS and 2.5 % NaOCl in a simulated root canal environment was observed. 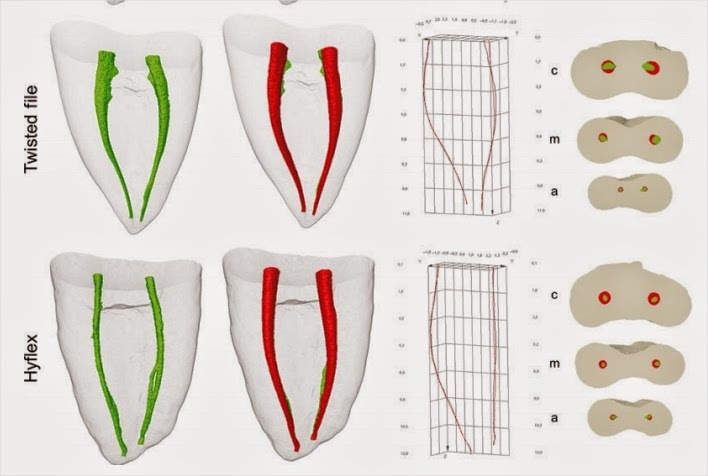 This study introduced a new methodology for mapping the irrigating solution in the different stages of the root canal preparation and proved useful for in situ volumetric quantification and qualitative evaluation of irrigation spreading and irrigant-free areas. 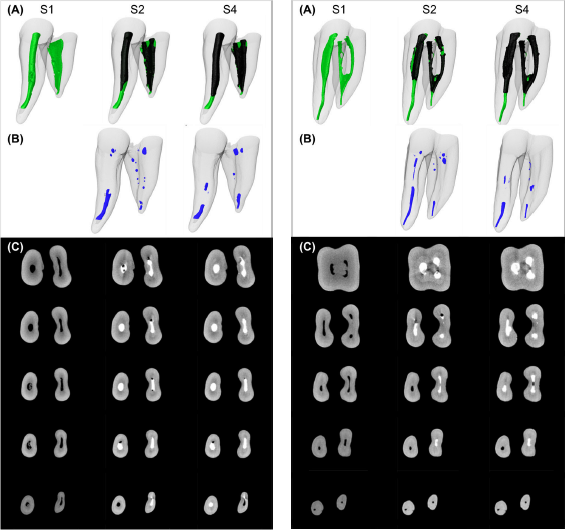 Micro-computed tomographic technology may provide a comprehensive knowledge of the flush effectiveness by different irrigants and delivery systems in order to predict the optimal cleaning and disinfection conditions of the root canal space. The current edition builds up on this platform established by the previous edition by updating and revising concepts, materials and techniques. “Clinical Notes” boxes have been introduced in each chapter highlighting the pertinent important clinical aspects of the topic being discussed for the benefit of the readers. The style and format of presentation has also been changed to make it reader friendly. Accompanying the text is a “Visual Masterclass DVD” presenting videos of important clinical procedures. 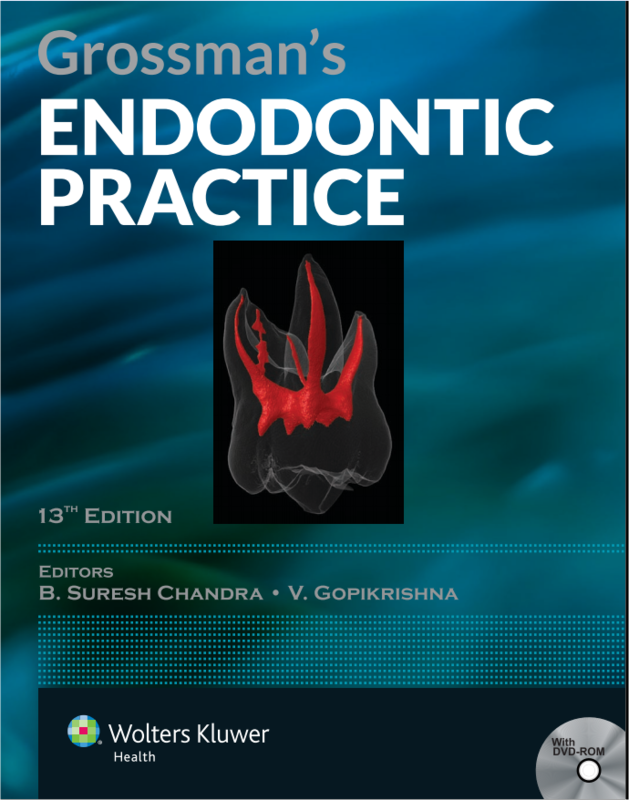 Two new chapters were added: “Regenerative Endodontics” and “Endodontic Emergencies”. This book contains over 1100 figures, radiographs and illustrations; many of which are contributions from clinicians and academicians from across the world. 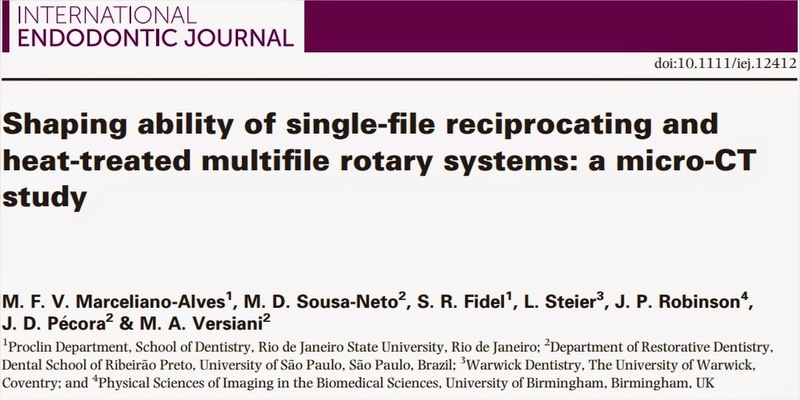 The Department of Endodontics of the University of Sao Paulo, Brazil, is honored for being invited to contribute with this outstanding book. Thanks to the Editors, Dr. Suresh Chandra and Dr. Gopikrishna, for this unique opportunity! 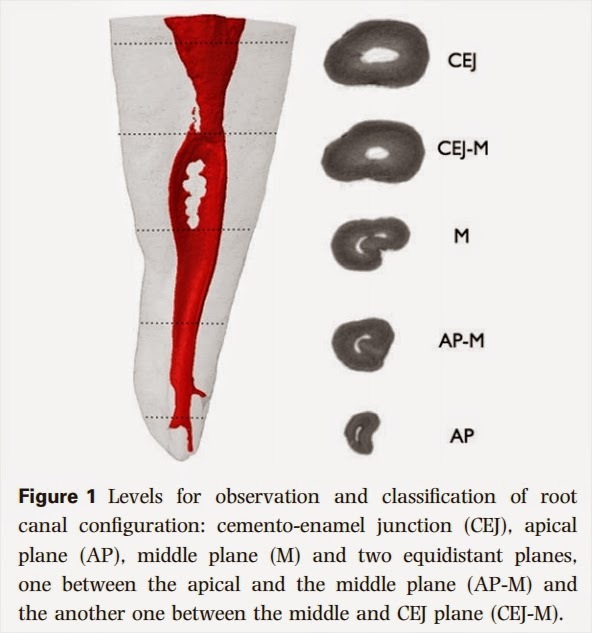 Anatomical complexities of root canals represent the main issue in the root canal treatment. 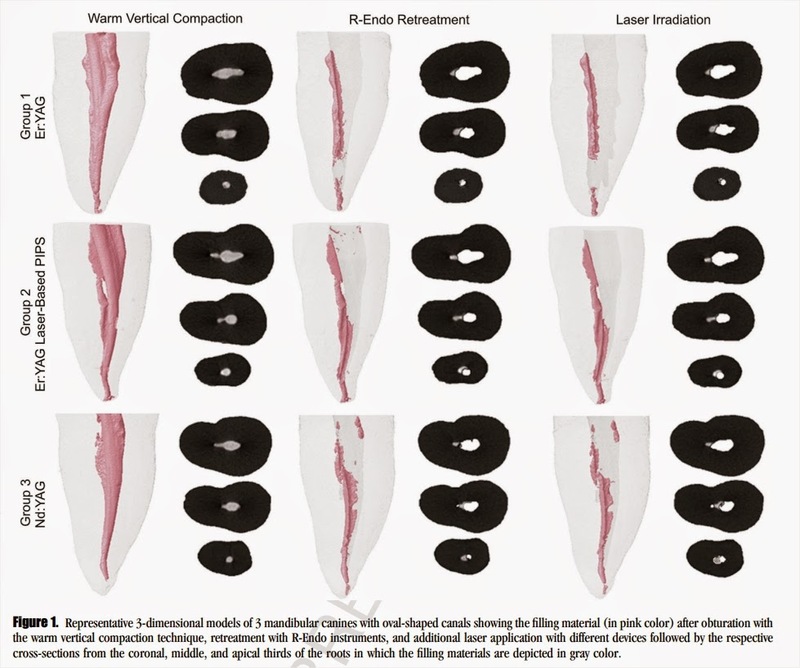 Recently, micro-CT imaging technology has been used as a powerful research tool in endodontics. This presentation will focus on the complexity of the internal anatomy of teeth and its relationship on the understanding of the principles of canal preparation and obturation. 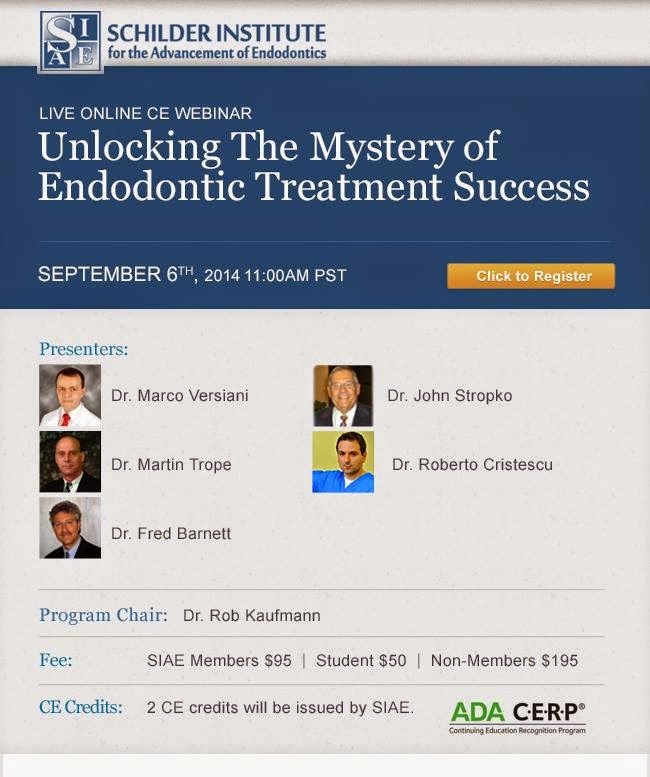 For registration click here: https://schilderinstitute.com/event/unlocking-the-mystery-of-endodontic.